The Alcohol and Tobacco Tax and Trade Bureau (TTB) today announced it will establish The Rocks District of Milton-Freewater as the newest American Viticulture Area (AVA) on Monday, Feb. 9. The AVA is situated on an alluvial fan of the Walla Walla River, where the river exits the foothills of the Blue Mountains and enters the Walla Walla Valley. It lies entirely within the state of Oregon and includes part of the town of Milton-Freewater. The area contained within the Rocks District also lies within the Walla Walla Valley AVA, which in turn is entirely within the larger Columbia Valley AVA. Walla Walla terroir: it’s complicated. Walla Walla has come of age as a wine region – that was the theme of last week’s column,with the Decanter World Wine Awards International Trophy received by Walla Walla pioneer L’Ecole No 41 for its 2011 Ferguson Vineyard red blend as prime evidence. The international recognition that L’Ecole has received is terrific, but it more than one reason to believe the region has really come into its own. It is tempting to point to a single person, place or event as the key to a wine region’s success, but the real story is always more complicated. Napa’s stunning emergence as a fine wine center? Yes, Robert Mondavi’s bold move to open his eponymous winery was important. And yes, the stunning triumph at the 1976 Judgement of Paris was important, too. But neither of these events or even both of them together would have been enough to move the needle so far so fast. I’d say that it takes a village to get the job done, but someone else has already used that line. Each case is probably different, but for Walla Walla I’ve boiled it down to five important features, which I am calling the “Five Pillars” of Walla Walla’s success to endow them with a bit a of grandeur. They are, in the order I’ll be presenting them, the Land, the People, the Culture, the History and finally, what I am calling the Spark. This week I look at the Land. Geography is the basis of most wine region definitions but sometimes border lines on a map conceal more than they reveal about the wine-growing conditions within. This is partly due to the fact that AVA borders end up being as much about politics and economics as soil types. I wrote about the controversies and compromises that went into the Stags Leap AVA in Wine Wars, for example, and I’ve read that the final compromise decision on the borders of the original Napa Valley AVA were based on the reach of the Napa phone system not any geological survey. When you think of the Walla Walla Valley AVA you imagine a more or less uniform valley terroir, but when you actually examine it you find really quite stunning complexity. That’s the first pillar – the Land. 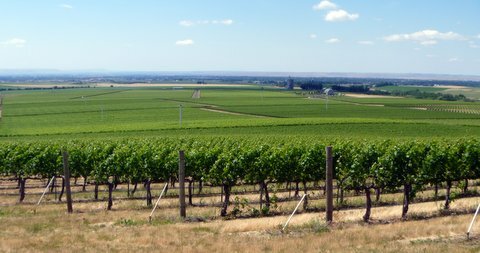 Walla Walla is a prime wine region because it doesn’t just talk about terroir, it has terroirs. You won’t find many vines planted on the valley floor in Walla Walla simply because the threat of winter freeze is too high (with one exception – see below). Slope, aspect and elevation are very important in order to get air drainage that protects the vines to a certain extent. Even with care in site selection some growers have adopted the practice of the buried cane or even burying vines themselves for the winter as insurance policies against a hard freeze. We were fortunate to attend a lecture on the Walla Walla terroir given by geologist (and Whitman College professor) Kevin Pogue and to have noted viticulturalist Alan Busacca guide us through three vineyards that illustrated three distinctly different terroir types. We had the pleasure of tasting wines from each area in the vineyards that produced them, which was a special treat. We started at Les Collines vineyard, an example of a loess-covered terrace site according to my notes. The wind-blown silt goes down dozens of feet and the vine roots drill down to the complex coarse grained Missoula flood deposits that lie below. Les Collines supplies grapes to many of Walla Walla’s best winemakers. Although the growing conditions look much the same throughout the large vineyard as you stare down the slope (see photo) we saw that there altitude and other factors created a surprising diversity of micro-terroirs, which are taken into account in selecting grape varieties for each block. The dry farmed Yellow Bird vineyard in Mill Creek Valley is an example of a secondterroir type — loess-draped foothills with fine-textured clay-rich soils and complex minerality derived from Missoula flood deposits. We also visited one of the vineyards that Chris Figgins has developed in this area and the estate vineyard of Walla Walla Vintners, too. The wines we tasted from this valley were savory and distinctive — different from what we tasted at Les Collines. We visited “The Rocks” vineyard area in Milton-Freewater, Oregon to see the alluvial fanterroir and it sure was rocky! The rocks, built up over centuries are more than 100 feet deep. (One winery that draws fruit from this area calls itself Balboa. Rocky Balboa – get it?). Walla Walla actually has two alluvial fan areas, this one on the Oregon side of the border that is planted with grapes and tree fruit and the other on the Washington side that, alas, is now pretty much completely covered by the city of Walla Walla itself. Damn! Hate to waste good vineyard potential that way! The alluvial fan area is an exception to the rule that grape vines are not planted on the valley floor because of the winter freeze threat. Growers are willing to tolerate the freeze risk because of the distinctiveness of the fruit. Everyone expects the TTB to soon act on a proposal for Walla Walla’s first sub-AVA – The Rocks District of Milton-Freewater, which will officially recognize this unusual land. There’s a final terroir type that we weren’t able to explore on this trip – the canyons and steep slopes that radiate from the valley. Gotta go there next time because everyone was talking about the potential for cool climate wine grapes such as Riesling and Pinot Noir. A trench cut into the vineyard suggests the depth of the rocky soil. If it is true that wine is made in the vineyard, then terroir – the Land in my list of pillars – is a critical factor and Walla Walla has distinctive terroirs for wine enthusiasts to explore and enjoy. Of course not everyone agrees that wine is made in the vineyard and one mischievous winemaker (I won’t reveal who) was passing around a wine for us to taste. Guess what it is and where it comes from, he said. I sniffed and swirled and tasted and I knew just what it was because I had tasted it before recently. That’s Grenache from the Rocks, I said with some confidence. That’s what it is supposed to taste like, he laughed, but it is actually Merlot from a completely different vineyard site. He has deliberately manipulated the wine in the cellar to produce an unlikely Cayuse impostor. Walla Walla is noteworthy for the variety that the land presents and just to make the point Alan and Kevin took us to one road cut area where we could clearly see the differences. Walking just 30 feet we moved from the rocky alluvial fan to a silty loess-covered terrace where everything about the grapes and vines was much difference. Quite an experience. Okay, Walla Walla has terroir, I’ve seen it myself, but I guess terroir by itself isn’t everything , but it is not nothing, either, no matter what some might say. But wait — there’s more. Come back for more about the pillars of Walla Walla wine success. Photos by contributing editor Sue Veseth. Special thanks to Kevin Pogue and Alan Busacca for sharing their expertise with us. Thanks as well to the McKibbens and their team at Les Collines, Chris Figgins, Myles Anderson, Gordy Venneri, the folks from Watermill and Cayuse, and everyone else we met on this research trip.